Three weeks into this caper and we’ve just passed the winter solstice – the shortest day in the year. It was pretty darn cold late in the week but I still managed to get to the beach. 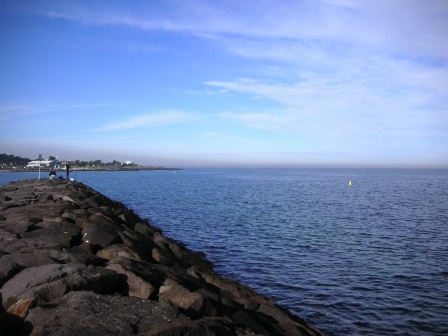 Swimming in the dark is quite safe at the Williamstown beach, as long as you remember the rocks that are submerged about halfway across. Given I can hardly take a decent photo in daylight I haven’t tried to take a photo of the beach pre-dawn. 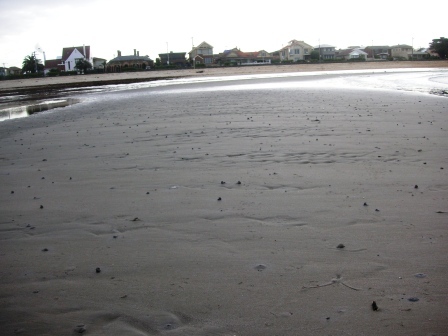 But there have been very low tides lately, so I tried a photo of the dark sand. Swimming in the dark is like swimming in ink: I wrote a story about this last year. 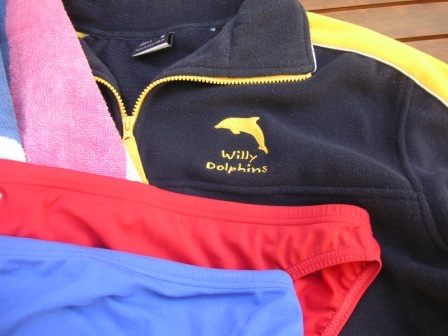 Have you swum in the dark? In the pre-dawn, or at night? Tell us more. On Friday 15 June I woke with a headache and decided against a morning dip. By midday the headache was clearing – a little – so I headed down to the water. Standing waist deep I looked out to the eastern yellow buoy, about 300 metres away, and saw some black figures moving. Swimmers in wetsuits, I thought at first. But not many swimmers jump out out of the water in an arc. Dolphins! And then I noticed all the bird-life. And a few fishing boats. I kept wading to keep my eyes on the dolphins. I called out to a dog-walker on shore and pointed to the dolphins. ‘Amazing!’ the bloke called back. I swam a little and then saw the dolphins (and the sea birds) heading away from shore. Of course, I didn’t have my little camera with me. Getting dresssed by my bike I chatted with Monica, from the Williamstown Swimming and Life Saving Club. ‘There were some dolphins sightings last week,’ she mentioned. Dolphins are rarely seen this close to shore, except for the morning swimmers (Andrew, Danny, Pam, Karen, Stephen, Mark, Clive, Kevin and another dozen or so of us) who have been wearing warm winter jackets the past month or so. 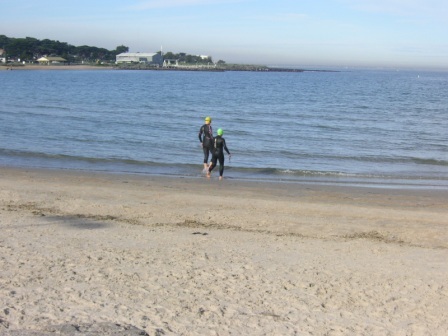 I started the Australian winter with two swims: one in the morning (in the dark) and one in the mid-afternoon. It was an auspicious occasion in two ways: the start of ‘365 swims’ was also the last day of a job that saw me desk-bound doing dull-dull-dull data-processing for eight months. The job was not good for my shoulders but swimming helped ease the discomfort. You can almost feel the knotted muscles untying as you move through the water. But two swims in one day does not mean you can have a day off any time. The challenge is to be in the water each and every day. I imagine there are many people who have been swimming 365 days per year for quite a few years. Hopefully over the next 12 months we’ll find such people – around the world! – and record some of their stories.